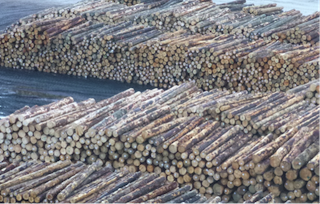 China is continuously exploring new sources of softwood logs around the world - Minor log exporters, such as Japan, Poland, Chile and South Africa all expanded their shipments to China in 2018, reports market analyst Wood Resources Quarterly (WRQ). Of the major log supplying countries, only Russia and Canada reduced their exports to China, while New Zealand, the US and Uruguay all increased their shipments year-over-year. Seattle, USA. China had another record year of softwood log imports in 2018, when over 40 million m3 of logs landed at Chinese ports. This was the third consecutive year of year-over-year- increases, with 2018 volumes being up 37% from 2015. Although import volumes fell slightly from the 3Q/18 to the 4Q/18, the December numbers were the second highest monthly imports on record. Over the past five years, import volumes have declined from the key supplying regions of Russia and Canada, while they have increased from New Zealand and Australia. New Zealand continues to expand its market share, supplying 44% of the total import volume in the 4Q/18, up from 30% just three years earlier, according to the Wood Resource Quarterly (WRQ). The biggest decline in market share has been that of Russia, which has fallen from 36% to 18% in the past three years. The only other major change the past few years has been an increase in pine log shipments from Uruguay. These have increased from just a few thousand m3 in 2016 to almost 2.5 million m3 in 2018, making the country the fifth largest log supplier to China last year.